Our "Wine Club" isn't much of a Club. Clubs charge you money and give you something less in return. We are a member of a bunch of "wine clubs" and I always feel let down when I receive our wine. Usually it is what they have the most of, and they give me a discount. Umm.. Thank you? So we decided not to do that. - Ever. We want to be that cool uncle that gives you the cooler version of what you wanted for christmas. You want a Red Rider BB Gun? Ok, you get the one with the scope and night vision. What we have here is a Family, and Family Comes First. Yea people will try to buy it out from under you, and they will fail. As far as everyone outside the family is concerned, we are SOLD OUT. Seriously, even though it is selling for a higher price in the tasting room than you are receiving it for we won't sell it. Because you took a shot on a little family wine "company" and said. Thats why we will protect your wines from the masses, Just for you. We don't charge you for it until it is shipping. and then we send you a movie about what you are getting. The last Allocation had over $200 worth of wine in it and cost $115. That is how Grandpa raised us. 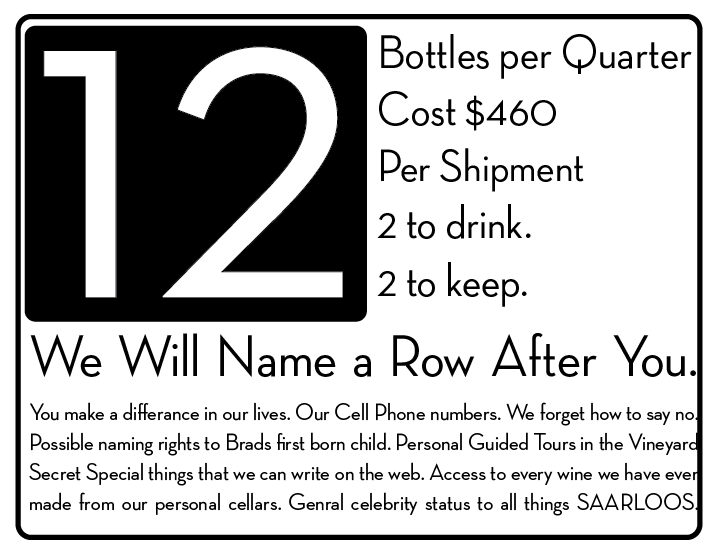 oh if you pick 12... we name a row after you.